I find in Vance's names, personal and geographical, many influences of various languages -- Celtic, Slavic, Germanic, Romanesque, even Hungarian and Finnish. I suppose, like any inventive author, he uses multilingual dictionaries to find colorful "associative" roots, and then modifies these morphemes according to his taste and context. 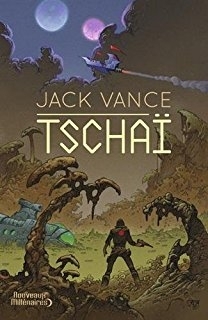 "Tschai" ("chay") is "tea" in Russian, for example. Hardly a coincidence. Good translation can be as good as the original. However, it is never the same book -- there is never an exact equivalence between languages. Some nuances and effects are inevitably lost; something different is added or emphasized to compensate for the loss. Sometimes (rarely) translations make even better impression than the originals. I strongly suspect that English and French translations of Dostoyevsky are better written than their Russian counterparts: Dostoyevsky is not a great wordsmith in Russian, he can be extremely awkward, sloppy, heavy, even stupid. Famous examples from Dostoyevsky: "He crossed himself with his right hand", it says in Dostoyevsky's Russian; "He crossed himself", it says in English translation. The latter is correct, of course. "He left, leaving the dead body where he left it", says Dostoyevsky (as if it isn't clear that the "body" is dead, and as if "he" would habitually carry the bodies of his victims with him); "He left without giving the still body another look", writes the English translator -- and this is much better! I have never seen a good English rhymed translation of good Russian poetry, for example of Pushkin (even Nabokov's translation of "Onegin" is nothing compared to the original). Perhaps, poetry cannot be translated well at all. Dante in Italian impressed me ten times more than Dante in Russian (while Lozinsky's Russian translation of Dante's "La Divina Commedia" is considered to be exemplary by the critics). Alexander Pushkin translated (probably, just to exercise his pen) several triplets from Dante into Russian, and he _was_ able to convey the terrible succulent tension and macabre beauty of these few lines. But Pushkin himself (who was fluent in French, Italian, and English) asserted that rhymed translation of the true poetry is impossible.